Cast members from the touring production of the smash hit The Lion King are raising money for two local HIV/AIDS groups with the special one-night-only revue Le Jazz Hot. Developed by Vancouver local and Broadway entertainer Ian Yuri Gardner, the show will feature Wendy Bollard and international and Broadway talent including Vusi Mhlongo, Kendra Moore, LaShonda Reese, Sophia Stephens, Omari Tau, Frank Wright II and other members of Disney’s The Lion King. Le Jazz Hot will feature solo and ensemble music, dance and audience interactive numbers in a setting of a 1930s/40s speakeasy. Door prizes will include tickets to The Lion King at the Queen Elizabeth Theatre. 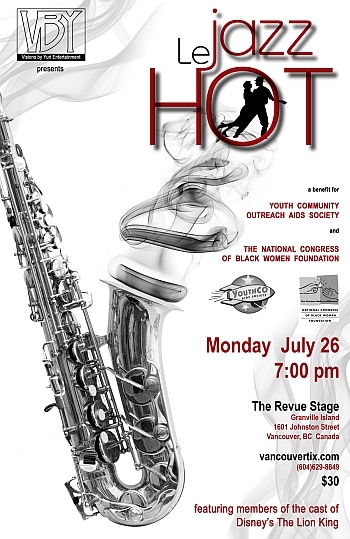 Funds raised will benefit Youth Community Outreach AIDS Society and the National Congress of Black Women Foundation in Vancouver. Youth Community Outreach AIDS Society is Canada’s first youth-driven organization leading the HIV and HepC movement through peer education, support, and shared leadership. YouthCO was formed in 1994 to address an identified need for youth-specific HIV/AIDS services and has been providing peer support and education throughout Vancouver and British Columbia, Canada. The National Congress of Black Women Foundation is a registered charity that promotes and facilitates leadership development, cultural awareness, health and education programs for black women and their families through funding and research. The NCBWF works in partnership with other organizations and individuals who support the goals and objectives of reducing the spread of HIV/AIDS infection and enhancing the quality of life for people living with HIV/AIDS. Disney’s The Lion King plays until August 8, 2010, at the Queen Elizabeth Theatre, 600 block Hamilton St, Vancouver. Le Jazz Hot plays for one night only on Monday, July 26, 2010 at 7 pm at the Revue Stage, 1601 Johnston Street, Granville Island. Tickets are $30.00 and are available online or by calling 604-629-8849. 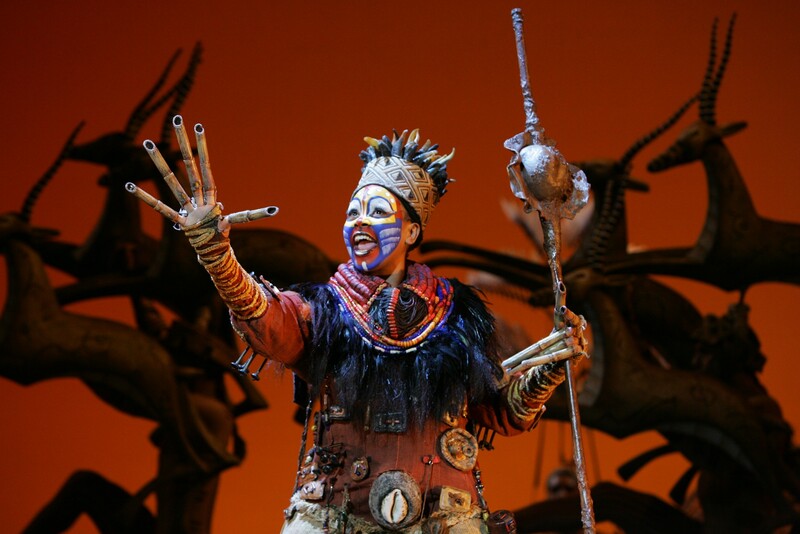 Local Disney and musical-theatre fans alike will be ecstatic to hear that Tony Award-winning musical Disney’s The Lion King will finally be coming to the Vancouver stage in July, 2010. Broadway Across Canada offerings have been relatively sparse in our city over the past few years and hopefully this announcement signals the beginning of a turnaround in the national touring productions that stop in Vancouver. 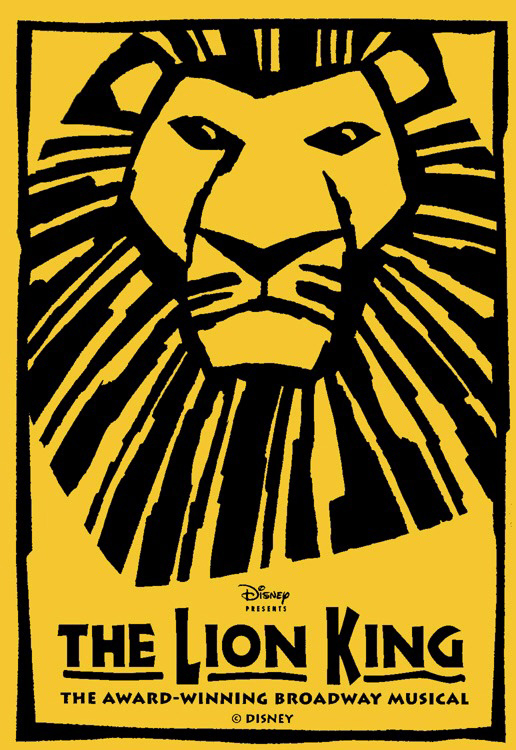 Based on the blockbuster 1994 animated film of the same name, The Lion King opened on Broadway in 1997 and promptly won a plethora of honours including six Tony Awards, eight Drama Desk Awards, six Outer Critics Circle Awards, the New York Drama Critics award for Best Musical, the Evening Standard Award for the Theatrical Event of the Year, two Olivier Awards, a Theatre World Award, the Astaire Award for Outstanding Choreography, two Drama League Awards and a Grammy Award for Best Musical Show Album. Choreography is by Garth Fagan, scenic design by Richard Hudson, costume design by Julie Taymor, and lighting design by Donald Holder. The Lion King features an adapted book by Roger Allers and Irene Mecchi and a score by Elton John, Tim Rice, Lebo M, Mark Mancina, Jay Rifkin, Julie Taymor and Hans Zimmer. Broadway Across Canada presents Disney’s The Lion King from July13– August 8, 2010, at the Queen Elizabeth Theatre, 600 block Hamilton St, Vancouver. Ticket prices range from $26.50 to $98.50 and go on sale in March of 2010.